Every child enjoys school if there is a healthy mix of study, outdoor sports activities and fun. Sports activities will make it easier for the child to socialize and interact with peer group. Children who enjoy schooling are more likely to influence their parents to keep them enrolled and send them to school regularly. Parents of children at construction sites and other migrant communities who see their children integrate with the local environment and enjoy school are also most likely to want to continue sending their children to school. 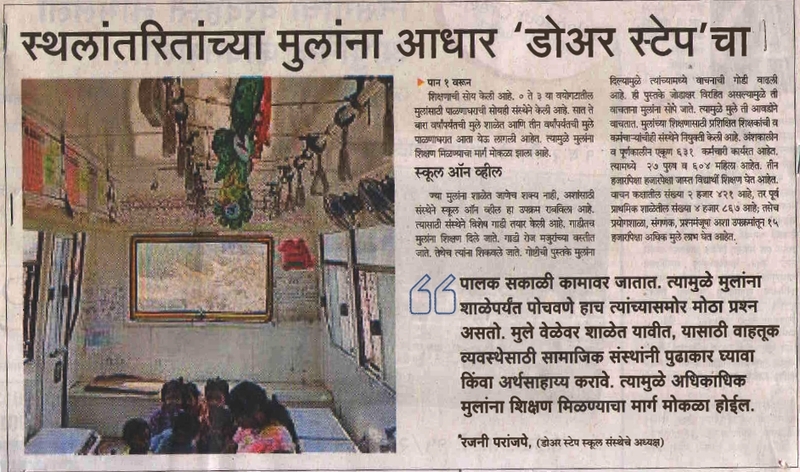 Towards the goal of the PPCE project to increase parent awareness and involvement in their children's education, Sports activity (Khel Kheluya) was organised @ Somji school in Kondhwa area of Pune, for the students of standard I & II. This will be an ongoing activity throughout the academic year and will be conducted by volunteers Ms. Archana Vyavaharkar, Mr. Nitesh Dulal , Mr. Nishant Pradip Katekhaye, Ms. Sadaf Shah and Mr. Yogesh Dagale. Here is the first hand experience of Archana Vyavaharkar. 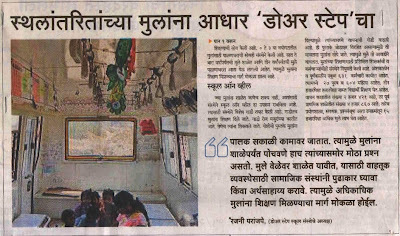 As a volunteer for the ECC campaign and now for the PPCE project, I have been to various PMC schools in Kondhwa and Mohammadwadi area in the last two years. A visit to any school somehow always infuses me with energy. There is so much of it in the children, it is no surprise then that my battery also gets charged! Last Saturday, as a part of the PPCE project, some volunteers had come to Somji School, Kondhwa to conduct some fun and games for the first and second standard children. The aim of this activity being to convey to the children that school is not just reading, writing and counting but also fun and games. They should enjoy their schooling so much that they themselves should want to come to school. In fact, they should insist and pester their parents to take them to school no matter where they are! As it was the first day of this activity, the PPCE staff was also present. The volunteers and PPCE staff were welcomed by the school principal and introduced to the Std. 1 and 2 class teachers. They appreciated the PPCE team’s effort in mainstreaming the children from marginalized communities. The school has been very cooperative and worked in tandem with the PPCE field staff. As a result, about fifty children from the marginalized communities have been enrolled in this school. It is heartening to know that they have been attending school regularly. I requested the class teacher if I could speak to the Std. 1 children. We were standing outside a class room and I was surprised when she asked me to simply turn around and enter an almost silent class! About 50 children in smart uniforms were sitting at their colorful desks with a picture book and pencils. They were all watching the screen in the front with great interest….. Fruits and vegetables danced on the screen. Some were coloring the pictures in their books. As soon as their class teacher prompted them they welcomed me with a ‘namaste’ and ‘good morning’. It was fun to talk to them and good to see them enjoying their first month of school. On being asked what they like to do outside the class, most of them wanted to jump and run, or play ‘chor-police’. They were excited when they were told we would take them downstairs for some fun and games. Just before leaving their class, the class teacher asked them to give me a silent applause! As I wondered what it was, they raised and shook (more like trembled) their hands! I was most impressed and said ‘thank you’ softly. One little voice promptly said that I could speak loudly as one person talking is not ‘noise’ and everybody should be able to hear what I said! If only the participants of TV debates were as smart as these kids! They formed a line and went down the stairs. After assembling in the stilted area, there was a short prayer. This was followed by an action song which the children participated with enthusiasm. They were then divided into four groups and the volunteers conducted some simple group games. Some children were shy and had to be encouraged to step out of the circle; some were so enthusiastic, they were willing to run on behalf of the shy ones! For some, it was the first time they were socializing with their class mates… so far they knew only the person sitting next to them in the class and hesitated to sit next to somebody different. By the end of the hour they had come out of their shells and jumped and skipped with more abandon enjoying the whole experience. A ‘caterpillar’ line was formed at the end and they smiled and waved us goodbye before going back to their class. Thank YOU dear children. It was wonderful spending time with you. As usual, I also learnt a lot from you. One has to come out of our protective cocoons to experience and share the joys in this world. I hope more adults will step out of their shells and take this opportunity to volunteer and spend a couple of hours with children and increase their own happiness quotient! And now the applause……I hope you can see me….I’ve also lifted my arms and am shaking my hands in your honour.